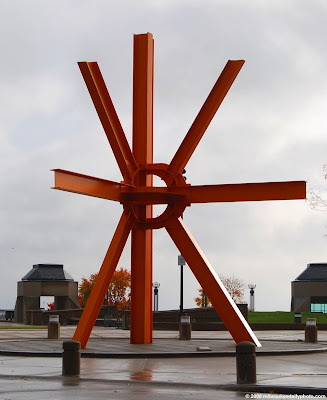 Born in China to Italian parents, Mark di Suvero is a prolific scupltor, with works all over the US and around the world. Milwaukee is home to some of his pieces, including this one, "The Calling". The sculpture has been controversial since its installation in 1982, and continues to be today. I absolutely hate this thing. Driving down Wisconsin Ave and seeing it DIRECTLY in front of the art museum has always driven me crazy. I know it was there first but still. Actually, di Suvero was open to the idea of moving it so that it wouldn't obstruct the MAM. But no, of course the City Fathers couldn't have that so it stays diametrically opposed to the beauty of the MAM.